Simon Says Stamp Flickr Challenge #63 is all about making a project using your favorite technique. One of my favorite techniques is die-cutting. I love dies of all kinds, especially the large bold die-cut sentiments and words. They can easily become the focal point of your card design! 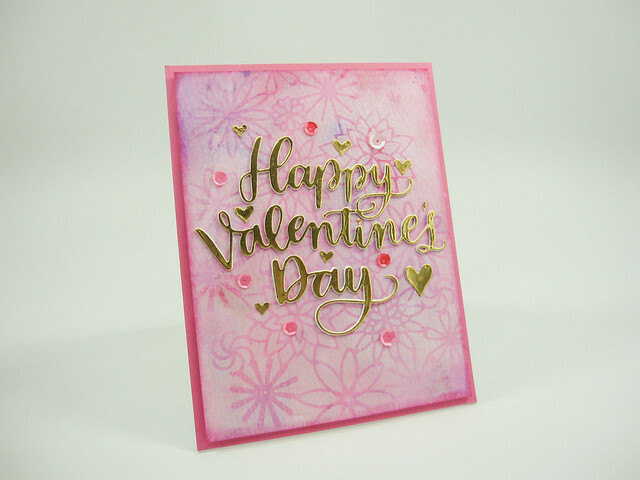 The card I made uses one Simon Says Stamp’s recent sentiment dies, the Big Valentine’s Day die. The sentiment was die cut from gold foil cardstock. I also die cut the sentiment two more times using white 80# cardstock and then adhered the three pieces together for a more raised look. The background I mounted the sentiment on was created using washes of Distress Inks in several different colors on watercolor cardstock. Once the watercolor cardstock panel was thoroughly dry, I placed a floral-patterned stencil over it and used a dauber to gently dab on white pigment ink. The pigment ink I used has a slight sheen to it. I had to be careful while inking the stencil because the stencil was quite delicate, with a lot of open areas. The end result was soft floral impressions against a rosy pink watercolor background. I liked the effect, vibrant, but soft enough to not overpower the die-cut sentiment. I added a few sequins and some tiny die-cut hearts. The tiny hearts were cut from the same gold foil used for the sentiment. The front panel was cut down to a 4 inch by 5.25 inch panel and the edges of the panel were colored with a sponge applicator to deepen the color around edges a little bit more. The finished panel was mounted using foam tape onto an A2, top-folding card base (Simon Says Stamp cardstock in Doll Pink). Dies: Simon Says Stamp: Big Valentine’s Day die; Memory Box: Heart Delights die (for the small heart embellishments – this die may be no longer available). Stencils: Memory Box: Modern Fantasy Flowers stencil. Inks: Distress Inks: Picked Raspberry, Spun Sugar and Wild Violet; Tsukineko: Brilliance pigment ink in Moonlight White. Cardstock: Tim Holtz Watercolor Cardstock; DCWV gold foil cardstock from a foil stack; Simon Says Stamp cardstock: Doll Pink.